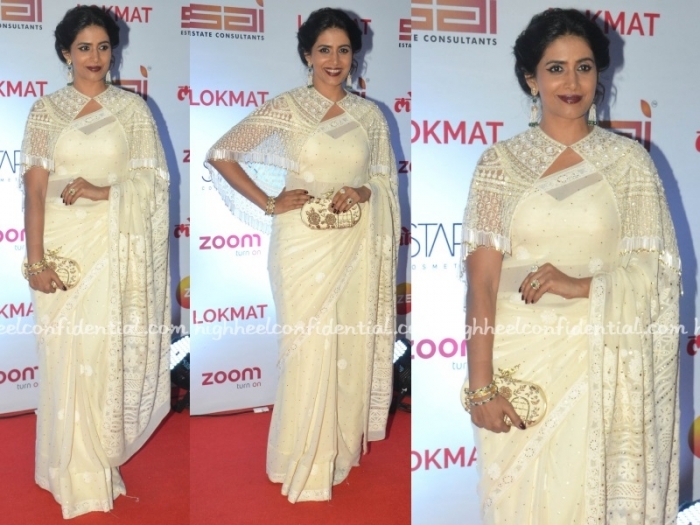 Wearing a cream chikankari sari and embellished cape by Shirrin Design Co. Sonali attended the Lokmat Most Stylish Awards. Hair in an updo, her look was finished out with jewellery from TDF Diamond and Gold and a beaded ivory clutch from Rusaru. She did look elegant in the sari. I am on the fence though about the lip color. At first glance, I felt a red would’ve fared better but the more I look at it, the less I mind it. At the Lokmat Maharashtra’s Most Stylish event, Saie was seen in a strapless Swapnil Shinde dress worn with her hair down in soft curls and black pumps. While she looked nice in the dress, I do feel like the face could’ve used a red lip in a muted shade to make the look pop a bit. Amruta attended the Lokmat Maharashtra’s Most Stylish event on Tuesday evening wearing a green velvet pantsuit from Sesgo with silver mirror pumps and layered necklaces from Forever 21. If you are averse to velvet, you probably will dislike this look right away. Also, the material doesn’t photograph well against camera flashlights. Having said that, I do love velvet pantsuits and quite liked her here and a lot of that has to do with the color. The tailoring of the blazer could’ve been a bit crisper and she could’ve used a shoulder bag to put the phone in.